I’ve just realised why I have a problem telling people about social anxiety – well, one of the problems. I say, “I suffer from social anxiety.” It’s true – it causes suffering. But I say it because that’s the only way I can think of saying it. It’s not what I really want to say. When someone says, “I suffer,” it sounds as if they’re asking for sympathy. “Oh you poor thing – I do hope you get better soon.” That kind of thing. But I don’t want sympathy. I’m not some poor, pathetic character who spends her life feeling sorry for herself. I tell people in the hope that they’ll understand why I am as I am. I tell them so that they’ll know this thing not only exists but is very common, even though it’s seldom mentioned. 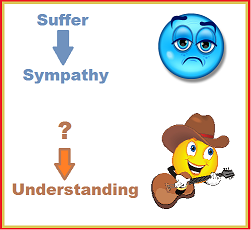 I want understanding, not sympathy. And as far as getting rid of it is concerned, I’ve come to the conclusion that no one does that. You can learn to live with it, to do things despite it, to stop letting it restrict you. But it doesn’t go away. It’s always there, somewhere. Anyway, coming back to the problem – the “suffering” one, how can I explain it without the S-word? Any ideas? I don’t know but I’d like to know. I have social anxiety but don’t say anything about it. Although I’d like people to know why I avoid places with lots of people, especially parties, and why when really uncomfortable I blurt out strange things. I guess I avoid saying anything because I don’t want to seem like I’m making excuses, I don’t know. Just hoping no one notices is my usual way of handling it LOL. Or a question: Have you heard of social anixety? I agree with davidrory. You live with social anxiety. People live with certain issues, thus sympathy is a none-issue. It can be interpreted as overcoming because that is what you do. You deal with, work through it and overcome it.